It's been awhile since I've touched base with my readers and I thought - "What better time to refresh and renew my monthly newsletter than Spring?!" Truth is with the nice weather coming about I've felt happy and alive and it's inspired me to write again. Just over the past month or so I have realized that I just have to be happy to enjoy life more. Earlier this week I was listening to "The New Psycho Cybernetics" by Dan Kennedy and something he said motivated me to look into "self acceptance." Last night I stumbled across an interesting article on Self Acceptance. What I got out of it is not to be so hard on yourself. By not punishing yourself for your mistakes you end up enjoying a more happy and fulfilling life. For the past year plus I've had my "nose to the grindstone" in pursuit of success, thinking, "When I achieve this," or "when I get that," I'll be happy. What I failed to realize is that success in any endeavor is achieved because you already are happy not because you mark a milestone. I even forget how far I have come since I was recovering from a coma, having to learn how to walk, talk, and eat again. I have the whole world in my hands and even I forget this sometimes, beating myself up for not achieving this and not reaching that goal. I realize that happiness isn't everything, but it's very important. Being happy puts you in a better position to be successful and achieve more of your goals in life. I don't know the exact stat but a happy person beats a mean person any day of the week! I'm a big advocate of self improvement books and tapes so I always thought that "self acceptance" was to be satisfied and not striving to improve. This couldn't be further from the truth. By saying you are practicing self acceptance you are in essence saying, "I'm thrilled to be me, right now!" but you are not saying, "I'm thrilled to be me and I never want to get better!" Self acceptance can be directly related to happiness so once you accept yourself (and any vices that may come with you), you allow yourself to be happier! I BELIEVE that there is a link between success and happiness but it is my view that you have to be happy with what you have. There's a word for this and it's called gratitude! When you give thanks for what you already have it opens the door to the things that you want?! Need a lift when you're feeling down or discouraged? There are times when we all need to step outside ourselves and our busy day-to-day world to get perspective. As a motivational speaker with profound experience with overcoming adversity as a young teenager, Nick 'gets it'. He understands how important that balanced perspective is and will inspires you about it in his presentations and his e-zine (Not getting the e-zine newsletter? Sign up below and check out the Newsletter Archive issues too!). Every month, Nick writes about someone who has succeeded in spite of, and maybe in part because of, monumental issues in their lives. These inspiring stories highlight these motivated individuals and make us aware of ways to accomplish things in our own lives we thought were impossible or too difficult to try. Sign up for Nick's e-zine newsletter below and look for your first issue near the end of each month. Nick also makes his newsletter archive available for you. "Nick's commitment to excellence has consistently transcended any human weakness, and inspires those around him. I recommend Nick to speak to any group of people in any walk of life, because his message is one of exalting influence. It was a memorable day in my life." "Your poise and your confidence before such a sizable crowd were inspiring... Your Story and your courageous efforts to complete recovery are very gratifying to us here at Franciscan and remind us why we do the work we do." Nick Prefontaine's life changed forever on February 5, 2003 at the vulnerable age of 14 when he had a life-threatening snowboarding accident. When a life-changing event happens to us, we have choices in how we think about ourselves and how we handle the challenges facing us. Nick chose to turn it all positive and never give up on his path to success. The story he tells on this CD, several years later, will inspire and motivate people of every age and situation. Be inspired by Nick's story yourself and share it with others. •TRACK 1: Introduction by Darren LaCroix, Comedian and Award-winning professional speaker and film producer. •TRACK 2: Meet Nick Prefontaine and his father, Chris as Darren begins the interview. •TRACK 3: What was Nick like as a 14-year old, before the accident? •TRACK 4: February 5, 2003 The day of Nick's life-changing snowboarding accident. •TRACK 5: Devastating news for a father. How do you stay positive in the face of near death? •TRACK 21: ICU, then Rehab... now what? •TRACK 22: What's YOUR 'Coke & a grinder'? •TRACK 23: How will Nick's story help you with your challenges? This Audio CD is guaranteed to transform your outlook on life. It will make you think, then think again, about your priorities and the balance in your life. You will learn ways to meet and deal with adversity as a stronger, more positive, and more successful person. It was February 5, 2003 at 3:15pm and I was driving by myself to a business meeting at my attorney’s office. It was a cold, raw day, and as I drove down the highway, my cell phone rang. Typically, when I’m on the way to a presentation as I was, I would not take the call. Because I saw a number from my local town, I answered. I immediately got off the exit ramp and headed back towards the hospital. As I drove reality hit me: my son could be really injured, my son could die. If you have children and have never said that to yourself you are lucky. My chest felt like it was caving in; my eyes welled up, which scared me even more because I rarely cry. I frantically tried to leave messages for my wife to meet me at the hospital. My messages were so frantic that I suddenly didn’t want her to hear them because I didn’t want her to panic, so I called our voice mail and deleted them. I arrived at the emergency room and was handed a bag full of clothes that were cut off my son and was told that he is still unconscious. Waiting for my wife in the ER, I sat clutching the bag of clothes, doing nothing, just trying not to panic in my head. I sat by the ambulance door in the ER, a very cold room in every way. When she finally arrived we didn’t have words—we just embraced. Like most people, I never thought something like this would happen to us. We were shortly thereafter joined by our neighbors who are doctors. They began to decipher what the doctors working on Nicholas were trying to tell us. Nick had multiple brain injuries from the fall. We still did not know how he fell or where he fell or why he fell. They finally let us go up to the floor where Nick had been transported. We were excited thinking we could see him but sat waiting in another stark room for a few more hours. While we were in the waiting room still unable to see Nick, people began to hear what happened and came to see us. The school moderators showed up, family, and friends showed up. The school moderators and children explained to us that it had been icy that day on the slopes and Nicholas went off a twenty-five foot jump and at the very top caught an edge with his snow board. It was one day that season that he had forgotten his helmet. When he hit the ground he tumbled and that caused not one injury but multiple. 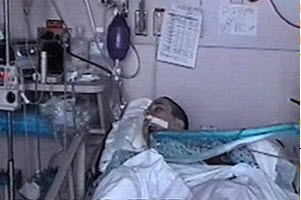 As he lay there in a fetal position the decision had to be made on the spot to intubate him, a very delicate process, which entailed giving him a shot to temporarily paralyze him in order to put a tube down his throat for oxygen to flow. We were also told that there are only a handful of paramedics in the area that could perform this procedure and the closest one was at UMass Hospital, which is about a twenty-five-minute drive from the mountain. In twenty-five minutes without the proper amount of oxygen Nick would have severe damage. Scott, the paramedic, was one of the best at this procedure. He got the call at UMass (UMass Memorial Medical Center) and rushed to meet the ambulance transporting Nicholas and was able to meet half way and intubate him. Scott later told us that had Nicholas not had that procedure he would not have made it alive to UMass, and even if he did he would have had severe brain damage. At about ten o’clock that night, which is more than six hours after I received that first phone call, we were told Nick was in a room now and we could go see him. What we saw in that room shocked and horrified us. No other moment in my life has been that intense. We entered a dark room that was lit only by machines, more than ten machines hooked up to him. He was a shadow on the bed, a lump, not moving. The only life in the room was coming from the machines: I was scared and felt powerless. This boy who was lying in the bed had his mouth open because there was a breathing tube coming out of it. As the doctor explained every machine and what organ it supported, our minds swirled. My wife had to sit down. I stepped closer to Nick. With some guilt and embarrassment, I can only now admit that it took me a few moments to recognize him not only as Nick Prefontaine but as my son. He was in a coma. His head on one side was swollen like a basketball, and he had purple and black bruises all over his face and head. A few minutes after we saw Nick, the doctors came in to speak to us for the first of many consultations, discussions where we made decisions about Nick’s life, decisions and conversations between ourselves that would become a normal part of our day for the next eighty-five days. Our first decision: Because of the pressure in Nick’s head, the doctors had to get our permission to have the surgeons drill a Burr Hole in his skull, into which they would place an intracranial pressure catheter to relieve the pressure. The entire first night the nurses continually tried to wake him. But he did not wake up. Little did we know that during the next four weeks as he lay in a coma we would be given updates that got worse and worse. 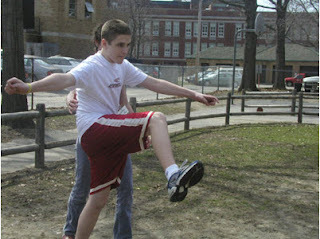 We would be told that more than likely Nicholas would never be able to walk, talk, eat or take care of himself. Ugly thoughts just kept filling our heads, thoughts mostly about Nicholas and how hard his life would be, not to mention our lives and how they would be forever different. Our world had stopped, and we were looking at a grim picture of our future. We were still at UMass during the month of February, and we were seeing very slight movement and twitching on one side but nothing from his left side whatsoever. We had family around him at all hours of the day and night. He was never alone. We all agonized about the readings on the many machines hooked up to him, which stressed us all out every hour of the day. Numerous nights, he coughed from something caught in his tubes, and we jumped to our feet but could do nothing but yell for nurses, and they came in and cleaned out his tubes, and we watched, helpless and frustrated, as our only son fought by himself for each breath into the machine. Worse than that were the nights when I’d be sitting there and things seemed calm and no nurses were nearby and he would cough and his entire body would jolt and shake the bed, which is especially scary and unsettling because he never moved at any other time. Those were the times I just wished the nurse could be sitting there with him, but that was not realistic with hundreds of other children in the hospital. Every snowstorm brought worries of what would happen if the power ever went out. Do they have back up? How will all these machines still run? I tortured myself with questions like that. Where did Nick think he was? Could he think? Was he in darkness? Our family—all cousins, aunts, uncles, and grandparents—literally took over the waiting room in an attempt to make it a place where they wouldn’t mind hanging out, a place that looked like home. They decorated it with flowers and things from home like afghans and magazines and some family photos. Nobody else outside the family minded; in fact, other families appreciated it and said so. There was a lot of love in that waiting room, and we shared it with others who were suffering their own nightmares. Each doctor visit to the room where Nick lay in a coma brought more dismal news. We always asked the doctors to step outside the room because we believed Nick could hear. When the doctors left we would whisper in Nick’s ear that he has bumped his head and we’re here with him and everything is going to be ok. This was one of the hardest parts for us, maintaining composure with our voices. We started filling him with hope and positive thinking while he was still all but dead to the world. •Provoked hundreds of children to wear helmets at the local hills the very next day. •Slowed my thinking and lifestyle. I remember during Nick’s second or third week when my older brother visited from Illinois. He suggested that we videotape Nick. I remember my wife objecting, not wanting to film Nick lying in his bed, surrounded by machines. She was trying to protect him, of course. The whole situation was pathetic and sad and tragic, yet for some reason we trusted my brother’s instincts. He told me if Nick makes it through this he’ll want to see the video, and if he doesn’t, it’s the last days of his life. He made sense. Now that we have the footage and Nick can watch it, it not only helps him, helps the family and others that watch it, but it has helped hundreds of children and parents cope with similar situations. On February 23, they deemed it safe enough to remove the breathing machine and allow Nick to breathe on his own, which was a huge milestone but the first step of a very long journey. The first attempt to extubate him failed and he could not breathe on his own, so they had to put the tube back in and try another day. The letdown in the waiting room when we heard the news was draining. I remember my wife being in tears and hugging the nurse, a cheerful saint of a woman to whom my wife had become very close. So what came next was more days of watching Nick struggle. More days of the nurses coming in to clean out the tube and as they pulled the tube out, we had to watch him cough and struggle so hard that even though he was in a coma his body would come right off the bed. The daily goal remained: wean him off all machines and enable him to start his long road to recovery. But there were many baby steps leading to this initial goal. The next major step was to have him in a “chair” that supported his entire body so that we could wheel him around the hall. This was the first time he was out of his bed. Still not even close to swallowing or talking on his own, he was able to move his arm and hand on one side, but only after a huge struggle. It was at this time that he started letting us know he was mentally with us even though he couldn’t speak. On his second visit home from Illinois, my older brother leaned to Nick’s ear and said, “Nick, if you can hear me, give me the finger.” He stepped back and we all waited. Nicholas slowly raised his hand, his fingers not quite curled into a fist, and his middle finger slowly rose. There aren’t too many parents that would appreciate seeing their child making such a gesture, but it was reason for us to celebrate! We were overjoyed, and we all laughed and congratulated him. He followed that with the peace sign and a thumbs-up. Thinking positively, we planned ahead. We had to pick a rehabilitation facility that could attempt to administer therapies of all sorts in an effort to get Nick as close to “normal” as possible, despite the predictions of all doctors to date that it was unlikely he would ever walk, talk, eat or take care of himself again. The last night before the morning transfer is one I will never forget. It was one of only two nights that my wife and I decided we could actually go home together and get a night’s rest. Prior to that, she would spend days with Nick and I would spend nights, limiting our interaction on most days to passing each other in the hall. When we left that night Nick was aware enough to be annoyed by a feeding tube in his nose and kept struggling to lift his only arm he could muster enough strength in to rip out the feeding tube. When I returned in the morning his face said it all. He looked at us when we entered and without the ability to speak said: why did you leave me, look what they did to me last night. Because they could not sit with him every minute like we had for the past month, they put a mitt on his hand so he could not pull the tube out and taped it to the bar of the hospital bed. Here is someone who can barely move his arm and they taped that arm to the bed. I understood the nurses’ decision, but this frustrated and angered us nonetheless. My wife and I hugged him and assured him he was going to a terrific place where we were going to help him learn how to walk, talk, eat and take care of himself and that everything was going to be fine. We all boarded the ambulance together with Nick on a stretcher, and then our favorite nurse rode in the ambulance, and Kim and I followed in our car for the journey to Nick’s temporary home. At that time we didn’t know how temporary. We wheeled him into Franciscan Hospital for Children, and his rehabilitation journey began. The second week there he was able to sit up with support from nurses for two minutes—another major accomplishment. We started to fill the walls in Nick’s room with affirmations. He read them. He still could not speak and had barely enough strength to communicate using hand signs, but he read the signs on his walls. Seeing him in a wheel chair with every possible support was agonizing. His days involved twelve hours of Physical Therapy, Occupational Therapy, and Speech Therapy. He exhausted himself with his effort. At night, which is when I would be with him, I would sometimes have the opportunity to shower him instead of having the nurses do so, which entailed lifting him from his bed with a crane-like device and placing him on a flatbed-like surface with a liner and a drain so that he could be wheeled into a shower room. This boy was a star soccer player and a snowboard instructor, a very active kid with diverse interests and goals, and sometimes as I hosed him down and cleaned him up, I often felt so sad and weak that only his continued effort could lift my spirits. We were still not sure if he would ever be able to take care of himself. The nurses and therapy staff at the hospital made Nick’s progress possible. They work the miracles; I admire them and often felt small in their presence because of their seemingly unlimited love and patience for these kids who need them. They had to teach Nick everything: how to sit up on his own, walk on his own, throw a ball—all of these were major milestones. One of the struggles that stand out for me was watching them teach Nick how to speak. It’s hard for me to articulate just how difficult it was for Nick to learn how to speak again. I watched him and Julie—one of his therapists—for more than an hour one day as she kept coaching him and he kept struggling to make different sounds, and I remember thinking, Will he ever actually be able to form words? He worked day after day on sounds but moved onto words, simple ones at first. He used all his physical and emotional strength in these sessions, very slowly and carefully enunciating one syllable words like dad and ball and big, sweating as if he were running a marathon, and collapsing later on his bed in complete exhaustion. When he was finally able to whisper and started forming sentences, he told us that his goal was not only to walk but to run out of the hospital and go home; that was his only goal—to get home. Julie and Ray—another of Nick’s occupational therapists—helped Nick make many important transitions like going from those showers I gave him to his actually being able to take a shower by himself, which meant he had to remember things most people take for granted like what to do in the shower and how to get dressed. His progress stunned everyone involved, including his therapists, and we were all very proud, but never did we relax, because even though he was making progress he always seemed to have such a far journey ahead of him. And a long and arduous journey it was, but there were also fun times—as fun as dealing what we were dealing with could be. The hours we spent in his room as a family together we’ll never forget: the Sunday pizza nights with me, Kim, Kayla and Nick was our only time during the week that we could all be together; after all, I was coming down to sleep with Nick at five o’clock each night and Kim was driving home—the two of us sometimes passing each other on the Mass Turnpike, flashing our lights and beeping our horns at each other as we traveled our separate paths through this darkness. Nick’s sister also had a tough journey. I remember how strong she was throughout Nick’s entire Franciscan stay. At thirteen, she was as scared as any of us and was filled with her own doubts and worries, but she never missed a day and never gave up on her brother. Bob was fun, too. He was one of Nick’s favorite nurses there. I remember the great efforts he went through to help Nick play April Fool’s Day jokes on the other kids and nurses. Nick liked to interact with everybody there. He played video games with two boys who lived there full time and who had no family (one still lives there to this day). Nick’s struggle and successes seem to give them hope and they stopped by his room all the time. Nick said he felt like a role model, and he was. One of the boys, Sean, was a six-year-old who had suffered burns over his entire body. Another boy, Brian, had no hands and deformed feet and played video games with his feet and beat Nick and everybody else most of the time. Brian seemed oblivious to his plight when he played video games, and this affected all of us but especially Nick. These boys and a few others were not only Nick’s friends but they were his motivation at times. He grew close to them and still hangs out with Brian when he visits Franciscan. Both Kayla and Nick look forward to seeing him at Christmas this year. On April 25th 2003, about two months after being admitted to Franciscan Children’s Hospital, Nicholas ran out the front doors and into the parking lot with his therapists cheering him on. Of course, we videotaped it all. He followed that in May by not only graduating with his eighth grade class but speaking at the graduation. And when most of his fellow students went off to enjoy their summers, he spent his summer being tutored so he could enter high school in the fall. He was told that Math would clearly be his toughest subject due to the detailed thinking and numbers and the nature of his brain injury. He was determined not to miss any school. Prior to his accident, his goal was to attend the same private school as his father and uncles, but given his level that fall and still unsure of how fast he would recover or if he would recover, he entered his freshman year at the local public school. He maintained B and C averages and was able to go to St. John’s High School for his sophomore year. In the spring of 2005 Nicholas and my wife and I formed the Prefontaine Foundation that benefits Franciscan Hospital for Children. The Foundation donated $37,500 the first year and is on track this year to donate $100,000 by building an ultra modern PT and OT room and a solarium. The OT and PT room will allow kids to go to their therapy session on the same floor they live—the same floor that was Nick’s home for two months—instead of going down a floor and across the other side of the building. The solarium room will allow children who have never been outside or who cannot go outside because of breathing apparatus, to enjoy the sunlight without exposing themselves to the outdoors. When Nick returned to school in the spring of 2003, after hours of tutoring and therapy, he was asked to say a few words at his eighth grade graduation. As he walked up in front of a few hundred classmates, parents, and faculty, it really hit all of us in our family who had suffered with him. We all thought the same thing: look how far he has come. We never expected anything like this; we were happy he was alive, happier when he fought his way back to some kind of learning and functioning normality, and truly stunned when he far surpassed anyone’s expectations on that graduation day. He read a prepared speech with a calmness and confidence rarely found in a fourteen year old. There were lots of tears in the auditorium, and a standing ovation. In the summer of that same year, he was asked to speak at a University of Massachusetts Medical Center’s groundbreaking ceremony for the new Emergency Room. He accepted the invitation. It was at this point that I asked Darren LaCroix, a friend who is the 2001 Toastmasters World Champion speaker, to coach Nick in public speaking. He helped Nick who went on to speak to about a hundred people including UMass CEO, presidents, and various media representatives. 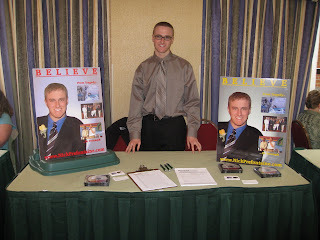 Nick told his story, and he received another standing ovation and appeared on the television news that night. He spoke again in Providence, Rhode Island to a network marketing convention of about 300 people. Franciscan Hospital for Children honored him in the Spring of 2004 and 2005 at an event at which he spoke to approximately 800 people, and he again appeared on the news with Natalie Jacobsen and Tim Wakefield from the Boston Red Sox. At Nick’s most recent speech, he was presented The Profile in Courage Award at Franciscan Hospital for Children and spoke again to nearly a thousand people. Nicholas received an A+ in Math this past semester and is reading on his own outside of school at the pace of three books per month. Other than the Profile in Courage Award, he has also received The Youth Community Award, The Sherri Shephard Award and the Heroes Among us Award from the Boston Celtics. He has continued his public speaking as well, telling his story so far now more than a dozen times at various events. But what Nick has really been getting into lately is the Prefontaine Foundation. Along with my wife and me and his sister, Kayla, Nick has taken a pro-active role in the fund raising, focusing on sponsoring and new relationships and overall hospital relations. Starting last Christmas ’05, he and his sister decided that they would not receive Christmas gifts and would instead shop with us to purchase gifts for the children at Franciscan. They look forward to this tradition each year now. Nick also has worked part-time with me throughout his junior and this his senior year, and he now owns his first real estate property. 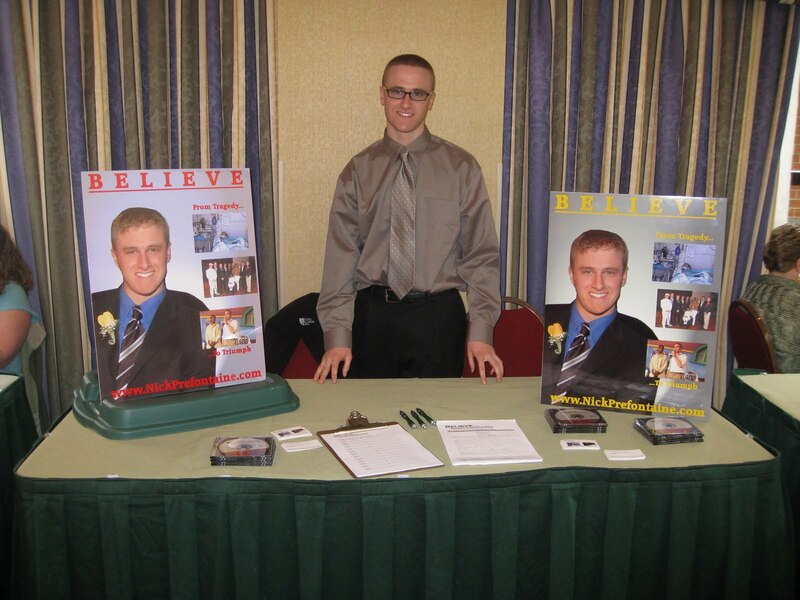 After his high school graduation in May 2007, Nick plans to become more involved in the family real estate business while he decides if, where, and when he will go to college. "Catching an edge" on his snowboard is the last thing Nick remembers about that day. He doesn’t remember the fall from the 15-foot jump that landed him in a coma with multiple injuries, most particularly a life-threatening brain injury. He doesn’t remember the ambulance ride to the emergency room when paramedics administered anesthesia to relax muscles contracted by his head injury, then inserted a breathing tube to help him breathe again. He doesn’t remember the weeks in intensive care at UMass Memorial Medical Center in Worcester, Mass., while his family worried for what his future might be. Doctors didn’t know if Nick would walk or talk again, or even breathe on his own. After three weeks in a coma, Nick gradually improved. After a month at UMass Memorial Medical Center, he was transferred to Franciscan Hospital for Children in Boston where he learned to swallow and walk and talk and read again. Nick first communicated by blinking, then by thumbs-up signals, then by drawing, and finally by speaking. As an inpatient for two months at Franciscan Hospital for Children, with double sessions of intense therapy (occupational, physical, and speech therapy, and tutoring) from 7 a.m. to 5 p.m., Nick always asked for the more difficult exercises. In physical and occupational therapy six days a week, he was determined to improve as quickly as possible to return home to his family, friends, and his education. Because he had continuing issues with his right arm and hand, he learned to write with his left hand. A family member was always with him, encouraging and supporting him, but it was Nick’s determination that made the difference. Doctors say his recovery is nothing short of miraculous and Nick is grateful for it all. For an understanding of how accidents like this impact the family, read Nick's Dad's Story. In spite of his continuing months of therapy and recovery, Nick graduated eighth grade with his classmates, getting good grades, and entered Shrewsbury High School with his friends. After regaining his skills as a freshman, he entered Saint John’s High School as a sophomore where he made the Honor Roll and graduated with his class, moving on to the rest of his life. Living in Rhode Island with his parents and sister, Nick is avidly learning about real estate as a business and has recently purchased several commercial real estate properties in collaboration with his parents and partners. He owns a company with his father that is focused on real estate investment, and business growth education and coaching. As a motivated and focused young man, Nick has spoken “kid to kid” to groups of students about his experience and the importance of making good decisions. He has a natural rapport with people of all ages and has spoken to adult and mixed audiences from 30 to 800 about overcoming adversity and the power of motivation and goal-setting. Nick has spoken to rapt audiences at high schools, awards ceremonies, corporate regional conferences, business associations, medical center openings, and fundraising events. As an acknowledgment and tribute to Nick’s courage and commitment, Franciscan Hospital for Children presented him with the prestigious Profile in Courage Award in May 2005. Shrewsbury (Massachusetts) Youth & Family Services awarded Nick the Outstanding Youth of Shrewsbury Award in March 2005. Most recently, Nick received the Boston Celtics "Heroes Among Us" Award in November 2005. In September 2006, Nick presented the Profile in Courage Award to the 2006 recipient at the Franciscan Hospital for Children Community Leadership Awards Dinner Gala in Boston. Nick was again honored, this time with past Profile in Courage recipients, at the 2007 Franciscan Hospital for Children Community Leadership Awards Dinner Gala in Boston. 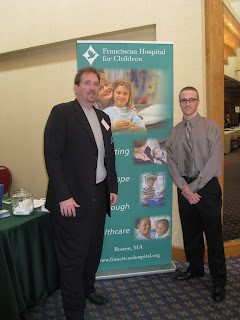 As a way of giving back, in gratitude and in honor of the caring and committed staff at Franciscan Hospital for Children in Boston, Nick and his family created the Prefontaine Fund and actively fundraise to support annual projects that promote the health and well-being of the remarkable children from around the world at Franciscan. Recent projects include 'Nick's Room', a state-of-the-art physical and occupational therapy room, and a new indoor/outdoor Solarium Room, both located on the medical rehabilitation unit where Nick received his life-changing rehabilitation after his accident. For more information, go to www.fhfc.org.